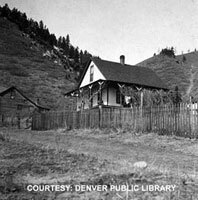 The most famous pioneer woman of Colorado was sixty-three years old when she retired to Palmer Lake in the spring of 1887 and built a cottage below Sundance Mountain in which she spent the remainder of her life. She died there on March 13, 1910. Life had taken her far away from her ancestral vineyards in Germany where she had passed her carefree girlhood, but the spirit of generosity and independence for which she was noted, and her love of the western wilderness, never left her. Countess Katrina Murat was born at Baden-Baden on the Rhine. In 1848 she was married to Count Murat. Not much is known of this romance of her life, for the Countess never cared to discuss it. The tradition among the old timers is to the effect that her husband was a wild young sprig of the French aristocracy; and that upon his culminating a long series of escapades by marrying the pretty daughter of a German innkeeper, he was discarded, once and forever, by his family. They came immediately to America traveling overland to California in 1852, over the old California trail through Wyoming, and back again overland to Denver in 1858 and once overland from Denver to Montana in 1864. Countess Murat had two claims to distinction. 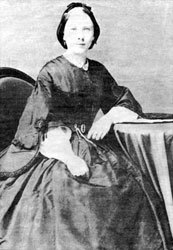 She is the only Colorado Countess, and she was the first white woman to enter Colorado, neither of which claim has ever been disputed. Horace Greeley, editor of the leading U.S. newspaper, the New York Tribune, went west in the summer of 1859 to personally verify extravagant tales of Colorado's golden riches. His stagecoach was hailed a half-mile outside of Denver by Count Henri Murat, a mounted, well-dressed gentleman who invited Greeley to accompany him to the El Dorado, the finest and only hotel in the baby town. The grandly named establishment turned out to be a seventeen-by-twenty-foot shack of cotton-wood planks, with a mud-and-stick chimney and dirt floors. Their only neighbor less than a year before was a great Indian lodge that stood directly across what is now Lawrence Street. The Indian women used to bring water and wood for Katrina, the first white woman they had ever seen. It came to be one of the attractions of pioneer Denver that it had a real live Count for a barber, and tourists made it a point to be shaved by him. Schuyler Colfax, Vice-President to Ulysses S. Grant, and numerous other famous men sat in his chair. When Count Murat, charged Greeley an exorbitant one dollar for a haircut, and his wife, Katrina, presented a bill of three dollars for doing his laundry, the famous editor grudgingly acknowledged that "the country harbored at least one man determined to make the best of his opportunities." The Murats were among the first Denver pioneers, arriving in early November, 1858. They wasted not a moment looking for gold themselves, but instead set to work preparing to relieve others of whatever dust or nuggets they were lucky enough to find. Though their claim to aristocratic title was dubious, there was no doubt that Henry and Kate as they were generally known in the West epitomized a great many early Colorado settlers. Henry Murat headed for the Pikes Peak country with no fixed purpose other than to make a fast buck. He pursued a variety of occupations-barber, dentist, innkeeper and gambler—making and losing several fortunes in the course of his lifetime. His passion for gambling was inveterate, and he never rested till he had staked his last penny. His wife, on the other hand, represented the stabilizing influence of women in the fledgling territory. Throughout her husband's fiscal fiascos and extravagances, she sustained a steady income by providing various domestic services to the overwhelmingly male population. Her apple strudels and pies brought two dollars each from homesick young men who missed fresh baked goods even more than they missed their mothers. Usually paid in gold dust, Katrina often stitched that currency into her waistbands and petticoats for safekeeping. It was said that she once had so much of the heavy metal upon her stout person that it took four teamsters to hoist her up onto her wagon seat. Another legend has the Countess single-handedly holding off rampaging Indians with a shotgun while barricaded behind sacks of flour. Countess Murat is best known as the "Betsy Ross of Colorado" for making the future state's first U.S. flag. The most likely of many versions of this story has Old Glory originally flying from the El Dorado's fifty-foot flagpole to greet the first over land stage arriving in Denver City on May 1, 1859. With no yard goods available in the rough new settlement, Katrina reputably fashioned the star spangled banner from her own red, white and blue French lingerie. This memorable sight, flapping in the breeze, provided a short-lived spectacle. The patriotic creation was stolen after just four days, little wonder in a town where males comprised more than 95 percent of the population. Henri died about 1885 and left his wife not a cent. And that's the reason old Catherine came to her little cottage at Palmer Lake. She earned that cottage herself, with her two hands, washing and doing housework. She came up here because she thought she could make her living keeping summer boarders. And so she could, for old Countess Katherine's linen is snowy, and her table smiles with home-made fare even as rheumatism lamed her back and crooked her fingers, and erysipelas impaired her eyesight. For twenty-three years Mrs. Murat, as she preferred to be called, was a member of the Palmer Lake community, living for the most part a quiet life aloof from town affairs. Her history is entwined not only with the annals of Colorado, but with all the Rocky Mountain states and the California epic as well, and she lived to see herself become an institution. 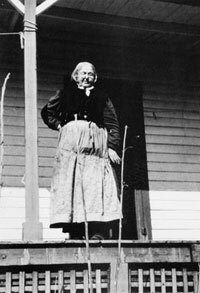 The Pioneer Society of Colorado saw to it that she did not want in her old age, and the Town of Palmer Lake piped water to her door and furnished her with a free supply as long as she lived. Noted persons interested in the beginnings of the West came from all over the country to visit her. Hardworking and resourceful women like Katrina Murat saw to it that the slapped-together boomtowns of Colorado cleaned up and made something of themselves. Men may have forged the trails and platted the towns, but women established homes and communities in the primitive and often wretched conditions. White women were a rarity in gold rush Colorado. The majority of '59ers were bachelors or left wives and children back home, intending to send for them as soon as they had scooped up an easy fortune. Only a few women accompanied their husbands, fathers or brothers west on their quest for a new life, however ill-considered or foolhardy that pursuit might prove. They did their best to put down roots in the dry and rocky foreign soil. The countess fulfilled that hope and dream. insight regarding the colorful history of Colorado and Palmer Lake. If you would like to learn more about Tri-Lakes history, the Palmer Lake Historical Society, or the Lucretia Vaile Museum, please e-mail us at PLHS@PalmerDivideHistory.org. © Copyright 1999-2017 by the Palmer Lake Historical Society. All rights reserved.